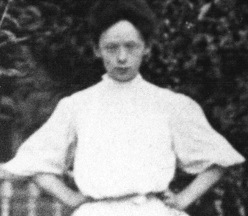 Bessie L. (Hopwood) LaClair was born in 1881 in Hopwood, near Uniontown, Fayette County, the daughter of Joseph M. and Sarah "Annie" (White) Hopwood. 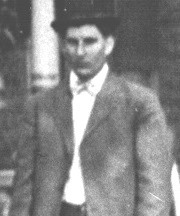 When she was 22 years of age, Bessie married 23-year-old Frank Brant LaClair (1880-1948), son of J. Louis and Mary H. (Patterson) LaClair of Hopwood. Their nuptials were held on Feb. 26, 1903, at Hopwood, with Rev. S.C. Benninger officiating. At the time of marriage, Frank was employed as a yard clerk with a railroad. The LaClairs initially resided in Uniontown and had two children -- Joseph Hopwood LaClair and Marjorie Ann Parker. When the federal census was taken in 1920, Frank continued his life's work as a railroader. Bessie was a lifelong member of the Asbury Methodist Church in Uniontown. In about 1926, Frank and the family moved to Scottdale, Westmoreland County, PA, where in 1930, as per the federal census, his position was yardmaster with the Pennsylvania Railroad. Their home was at 401 South Hickory Street. The census-taker spelled the family name "Le Clair." The 1940 census shows Bessie and Frank on South Hickory, with his work identified as "clerk - railroad." Having endured chronic heart valve disease, Bessie was stricken with a pulmonary embolism and passed away at home in Scottdale on June 14, 1941, at the age of 60. Her remains were returned to Uniontown for burial in the Hopwood Cemetery. Rev. J.E. Tracy officiated at the funeral. At the time, son Joseph made his home in Crafton, Allegheny County, PA and daughter Marjorie Parker in Vandergrift, Westmoreland County. Frank lived for another seven years. He relocated to Warren, Warren County, PA, where he dwelled with his married daughter and family at 16 Central Avenue. Stricken with cancer and cirrhosis of the liver, Frank died at home at the age of 68 on June 18, 1948. His remains were transported back to Hopwood for interment. Son Joseph Hopwood LaClair (1903-1985?) was born on Dec. 2, 1903 in Uniontown, Fayette County. Underneath his photograph portrait in the 1921 Uniontown High School yearbook are inscribed these words: "Man is of soul and body, formed for deeds of high resolve. 'Joe'; Technology. Honor Roll, A.A."
He married Agnes Brinker (1909-1977). They were six years apart in age and apparently did not reproduce. Pursing a professional career in what was a leading technology of the era, Joseph accepted employment with Bell Telephone Company, and initially worked in the Uniontown office. In the mid-1920s, he was based in the company's office in Greensburg, Westmoreland County. Joseph again was transferred and in 1940 they made their home in Crafton near Pittsburgh, residing at 56 Oakwood Road. In April 1953, he was named as new district manager for Bell in Altoona, where they relocated. Agnes served as treasurer of the Altoona Newcomers Club, and he was a member of the board of directors of the Blair-Bedford Council of the Boy Scouts of America and of the Altoona Rotary Club. In 1954, speaking to the American Business Club, he said the Bell's research was seeking "such telephone improvements as manual volume adjustment on the home set, wireless telephones that may be carried about in the lawn or garden, automatic answering devices that will answer calls in your absence or an automatic answering tape with a 'This is Joe Doe speaking'," reported the Altoona Tribune. Agnes passed away in Altoona in January 1977, at the age of 68. Frank survived his wife by nine years. He died in Altoona on Aug. 16, 1985. Their final resting places are not yet known. 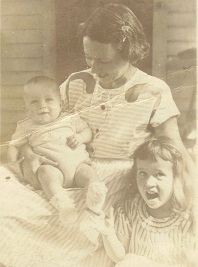 Daughter Marjorie Ann LaClair (1909-1971) was born on Feb. 10, 1909 in Uniontown. In early adulthood, she moved with her parents from Uniontown to Scottdale, Westmoreland County, where she taught school. Before marriage, in about 1930, she traveled to Pittsburgh to play tennis, and on the spur of the moment decided to stop into a photography studio and have her portrait taken. The image is featured here and among her children is called the "tennis dress photo." She married Frank Ruff Parker Jr. (1909-1998), and they had five children -- Frank Ruff Parker III, Joseph L. Parker, John S. Parker, James Philip "Phil" Parker and Katherine "Kay" Scheidler. Frank spent his career with the Boy Scouts of America. Initially he was employed at the Scouts' Schiff Scout Reservation national training center in central New Jersey. There, the family resided in Bernardsville, and one or more of the children were born. Circa 1954, the Parkers' son Frank III was pictured in the Boy Scouts Handbook, yawning as he got up from his sleeping bag. In the late 1940s, they resided in Warren, Warren County, PA. Marjorie's widowed father came to live under their roof until his passing in 1948. Marjorie signed his death certificate. At some point the Parkers relocated to Steubenville, Jefferson County, OH, remaining for a number of years where the children grew up. Eventually they relocated again to Lakewood, OH, where Marjorie again was employed as a teacher, in the Lakewood area. They were members of the Old Stone Presbyterian Church of Cleveland, where Marjorie taught a Sunday School class. Marjorie died in St. Vincent Charity Hospital in Cleveland on April 2, 1971, at the age of 62. Her remains were transported back to her hometown for burial in the Hopwood Cemetery. Frank survived as a widower for more than a quarter of a century. He married again in 1974, at the age of 65, to 56-year-old widow Lucille (Kinzel) Hutchinson (1918-1995). They made their home in Akron until Lucille's death in 1995. He lived for another three years and variously resided with his son Joseph in Mason, OH and son Phil in Peachtree City, GA. He died on Jan. 10, 1998, at the age of 88, and rests for eternity in Hopwood Cemetery. His grave marker erroneously is inscribed with the incorrect year of birth as "1911" rather than "1909." Son Frank Ruff Parker III (1940-1997) was born on May 5, 1940 in Mount Pleasant, Westmoreland County. He was a civil rights lawyer, legal pioneer and hero and widely beloved for his courageous and brilliant work and contributions to civil rights. He and his first wife, Virginia Foster "Tilla" Durr, produced a son, Ian Parker. On Nov. 26, 1971, at the age of 31, he married again to 32-year-old Carolyn Travis (1939-2009) who brought four children to the marriage, Terry Brown, Stephanie Parker-Weaver, Barbara Golden Thornton and Kevin Parker. Carolyn was a woman of color, and their interracial marriage in Mississippi was illegal in the state at the time. Rev. Dr. Hickman Johnson, of the Farish Street Baptist Church, officiated at the wedding. They resided in Jackson, the state capitol. Because Frank was forbidden by state law from adopting the children, the three youngest took his surname of "Parker." He often received death threats and had to changed his telephone number every few months to maintain some sense of security and privacy. After a second divorce, in 1980, he wed Ann Burlock Lawver, who brought a son to the marriage, Max E. Lawver. Frank spent his professional career advocating for the rights of minorities to vote in and to win elections in Mississippi and other bastions of bigotry in the United States. His 1990 book Black Votes Count received many awards, including one from the American Bar Association. The book has been widely praised for chronicling the legal challenges needed to uphold the Voting Rights Act of 1965 in Mississippi where it had become common to nullify black votes through at-large elections, racial gerrymandering, changing offices from elective to appointive, and unfairly revising the qualifications for candidates for public office. The work culminated in the 1986 election of Mike Espy, Mississippi's first black congressman since Reconstruction. Among his friends was fellow lawyer Melvyn Leventhal, once married to Alice Walker, author of the book The Color Purple. Frank obtained his law degree at Harvard and first went to work for the Office of General Counsel of the United States Commission on Civil Rights in Washington, DC. In 1968, at the height of civil unrest, deadly race riots and the assassination of Dr. Martin Luther King Jr., he relocated to Mississippi. He practiced there for 13 years as a civil rights lawyer, handling many court cases to provide relief for black voters and candidates. In about 1981 he returned to Washington DC when named Director of the Voting Rights Project of the Lawyers' Committee for Civil Rights Under Law. He was one of the leaders in the 1981-1982 effort to persuade Congress to extend the protections of Sections 5 of the Voting Rights Act (the pre-clearance requirement) for 25 years and to amend the Act to eliminate the requirement of proving discriminatory intent. He was also instrumental in enacting the National Voter Registration Act of 1993, the so-called "motor voter" law. As a MacArthur Foundation Distinguished Scholar at the Joint Center for Political Studies in Washington from 1985-1986, he conducted research for his book. In 1992, he returned to the Joint Center for Political Studies, where he did research on his forthcoming book, For the Common Good: The Case for Affirmative Action. He was named an adjunct professor of law with the District of Columbia School of Law. He was a visiting professor of law at American University, Washington College of Law, in 1995-1996. At the age of 57, Frank suffered a ruptured aortic aneurysm and died in Lexington, VA on July 10, 1997. His remains were brought to Uniontown, Fayette County to repose in Hopwood Cemetery, the sixth generation of Minerd descendants buried there, dating back to his great-great-great grandfather Henry Minerd (1856). In statements made after Frank's death, Judge David S. Tatel of the U.S. Court of Appeals for the District of Columbia Circuit and a former director of the Lawyers' Committee for Civil Rights Under Law said that "Frank Parker was one of this nation's truly great civil rights lawyers. He played a major role in striking down legally enforced segregation and discrimination, and because of his effort, the nation, and particularly the South, is a better and fairer place to live." In another comment, made Barbara R. Arnwine, executive director of the Lawyers' Committee, said: "Frank transformed the political landscape of Mississippi and, indeed, the nation. The legal strategies he pioneered and the many redistricting battles he fought made minority political participation a reality at all levels of government across the nation." U.S. Attorney General Janet Reno helped organize a memorial service in the Great Hall in Washington, with Rev. Jesse Jackson giving a eulogy. Jackson said that Frank was truly sensitive to the concept of a "rainbow coalition" because his first wife was white, his second wife black and his third wife Jewish. See his profile on Wikipedia and obituaries in the New York Times and Washington Post. Former wife Carolyn (Travis) Parker died from breast cancer on June 18, 2009. Granddaughter Stephanie Parker (1962-2015) -- nicknamed "Sistah Hurricane" -- was born on Sept. 30, 1962 in Jackson, MS. She was age nine when her mother married Frank R. Parker III. Stephanie grew up in the Word and Worship Church, led by Rev. Jeffrey Stallworth, and was baptized at the age of 12. Growing into womanhood in the home of a white father and black mother, in the spirit of civil rights activism, she devoted her life and career to serving the needs of the under-served poor in Mississippi. Observed Alice Thomas-Tisdale, publisher of the Jackson Advocate, "She grew up around civil rights icons such as Dr. Aaron and Ollie Shirley, Bennie Thompson, and her uncle, Jimmie Travis; and she was destined to be just like them." Following education at Jackson State University and Tougaloo College, Stephanie worked as a constituent services representative for the City of Jackson, during the administration of Mayor Frank Melton, spending time on issues of housing and community. She served for years as the executive secretary to the Southern Christian Leadership Conference (SCLC), a civil rights organization, where she focused on issues of racism, poverty and disempowerment. For a time, she also was employed as branch secretary and executive director of the Jackson City Branch of the National Association for the Advancement of Colored People (NAACP). Reported the Mississippi Link: "She led several civil rights battles throughout the state, and galvanized national attention when she spearheaded a challenge on behalf of a group of black landowners in Canton, MS to Nissan’s use of eminent domain. Stephanie won this major battle and the families were able to keep their homes. A modern day freedom fighter, Stephanie continued her quest for human rights throughout her career, organizing lawsuits and demonstrations, and fighting against injustices in all segments of our economy." She also helped her father and Senator Henry Kirksey battle voter identification law abuse. She was dealt a blow in 2008 when diagnosed with a rare form of breast cancer involving the HER2 protein which promotes cancer cell growth. Stephanie established the Rebirth Foundation and chronicled her fight with cancer in the book Rebirth: A Breast Cancer Journey of Many; Survival of Few. In 2013, she suffered a stroke. Sadly, she died on March 24, 2015, at the age of 52. She was survived by her husband Cordell Weaver (son of M.C. and Arcola Weaver), whom she had married on June 18, 1988, and three stepsons, Marcus Weaver, Michael Weaver and Maurice Weaver. Watch her MIC TV interview on YouTube. Granddaughter Barbara Golden Parker married (?) Thornton and makes her home in Camden, MS. She is active with Voice of Calvary Ministries and serves on the staff of Supportive Services for Veteran Families (SSVF), which assists military veterans in Mississippi who are homeless or in danger of becoming so. Grandson Kevin Parker served for 24 years in the U.S. Army, with duty in Iraq and also the Presidential Honor Guard, also known as the "Old Guard." Daughter Katherine "Kay" Parker wed Peter Scheidler. Devoted to education, she obtained degrees from American University School of International Service in Washington, DC; Brown University; Harvard University Graduate School of Education; and Boston University. For more than 20 years, she taught in an urban school environment in Providence, RI. Later, she obtained a position at Brown University as a clinical professor of methods of teaching English. 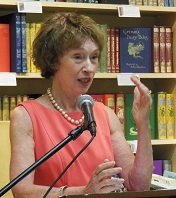 Said her publisher, "As Massachusetts school system Curriculum Director and Assistant Superintendent for Curriculum, Instruction and Assessment, Dr. Scheidler guided the first wave of new state standards and test under No Child Left Behind, facilitated and observed increased student learning, and now supports teachers in the next step up with national standards and tests." She is the author of Standards Matter: The Why and What of Common Core State Standards in Reading and Writing (Montgomery, AL: NewSouth Books Classics, 2015). In the slender volume, Kay spells out each standard to show that the Common Core State Standards "simply guide high-level achievement for all students, invite teacher innovation and creativity, and make school a more exciting place of learning." Son James Philip "Phil" Parker lived for many years in Peachtree City, GA, where he was a pilot with Delta Airlines. Today his home is in Loveland, CO. Son Joseph L. Parker lives in Mason, OH. Early in his career, he worked as an air traffic controller for the U.S. Air Force. Today, having returned to the private sector, he provides financial planning in terms of health and life insurance for small business clients. Son John S. Parker (1949-2002) was born on Jan. 17, 1949. He dwelled in Washington, DC. Suffering from the effects of alcoholism, he died in Washington at the age of 53 on Dec. 17, 2002. Many thanks to Phil Parker and Kay Scheidler for sharing their family photos.